Intro: The following instructions are for individuals who are interested in DIY silk screen printing as a hobby, using cheap methods and easy - accessible materials/supplies. Clear adhesive book covering (available stationery outlet) CNA, Waltons, etc. Design image/artwork using computer software. CorelDraw, MS Word/Publisher OR simply draw design by hand. Cut a piece of clear adhesive (A4 Size) and via computer printer print out design on the backside / paper-side of sheet of adhesive. Following the outline - cut out design with a craft knife. (NB: keep all the cut-out pieces). You need to figure out which pieces are needed o block out ink / fabric paint. Stick pieces on open areas/non-printing areas. Tape buff tape on rest of silkscreen to prevent fabric paint seeping through non-printing areas. 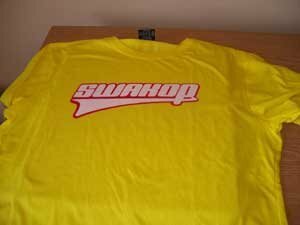 Turn silkscreen over on flat side/print side and place it over t-shirt. 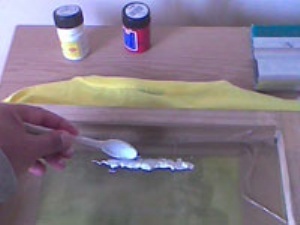 With a spoon, pour fabric paint on the edge your of design. 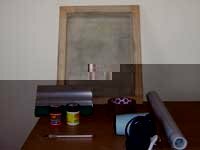 Lift screen and dry fabric paint with hairdryer. 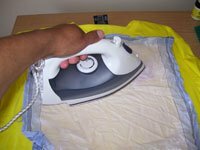 After thoroughly dry, heat set print with dry iron using a cloth/handkerchief. Place cloth over printed image and iron for 1-3min. Repeat on reverse side of T-shirt printed image. 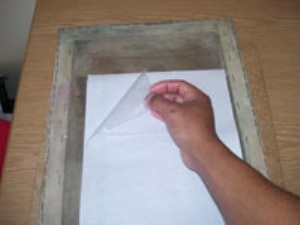 Remove clear adhesive from silkscreen right after printing Clean/wash screen with water using shower/spray head in sink/bathtub to prevent fabric paint from drying & clogging the screen. Use Dala opaque fabric paint on dark colour cotton t-shirts and Dala regular fabric-paint on light shirts. 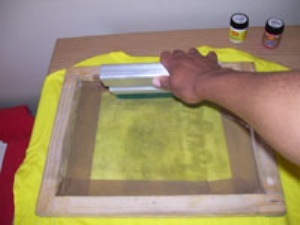 Use an old T-shirt or other fabric to test Dala fabric paint before printing. Re-Print/apply fabric paint 2-3 times to increase brightness, opacity/colour strength. 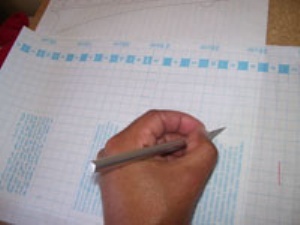 Use at-ruler to help straighten stencil when sticking it to silkscreen. 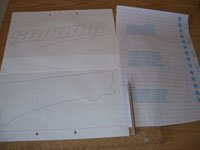 Use simple designs/big letters for easy cutting and sticking. This item has 1705 views.